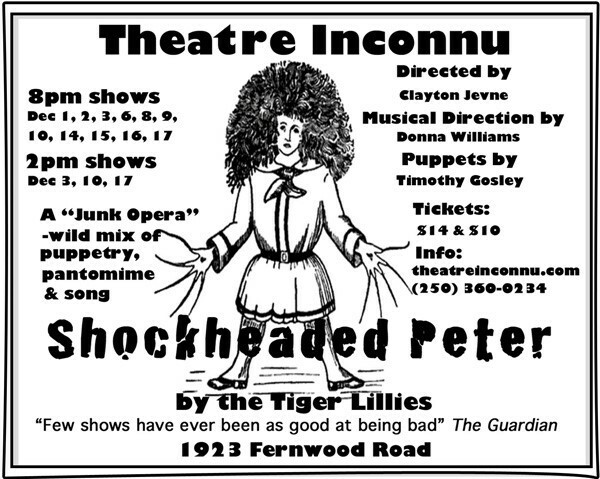 Shockheaded Peter at Theatre Inconnu November 30-December 17 2016 a review. You are here: Home / Arts / Shockheaded Peter at Theatre Inconnu November 30-December 17 2016 a review. If the idea of one more “holiday special” makes you unhinged, if you’re ready to shout “bah humbug” to the world–then the macabre, bizarre, perverse stylings of Theatre Inconnu’s Shockheaded Peter (on until December 17th) are for you. Prepare to cackle gleefully as disappointed parents dispatch their progeny with wild abandon and young children meet with a series of untimely deaths. One has to wonder how Mr. Hoffman managed, in 1845, to evade the censors with the original collection Der Struwwelpeter—advancing Edward Scissorhands by a century and a half. Clayton Jevne’s inspired and ingenious set recalls fairy tale books of yore with handsome hand-painted designs and the use of multiple entries and exits through doors, windows and bookcases. There are trap doors, floors that become walls and puppet manipulation from high in the sky. Marvellous low tech special effects suggest waves, rainclouds and streetscapes. Tim Gosley’s puppet creations are a wonder—from the gigantic stork who brings in the titular baby (Shockheaded Peter) to marionettes suspended from the rafters (Bully Boys), tiny dolls carried away on the wind (Flying Robert) and a larger than life-size and anatomically correct body suit (Shockheaded Peter finale), among others. Ian Case embraces the junk opera esthetic in costumes that borrow from the late 19th century with allusions to the late 18th (Rosemary Jeffery in a beautiful dusky pink moiré gown, coiffed with a wig reminiscent of Marie Antoinette) and even the mid-20th (Melissa Blank could at times be doing a cameo in Cabaret). There are fripperies galore—lace, ribbons, wigs, crinolines, colourful linings, bonnets and hats—to provide further visual enticement. The costume transformation in The Dreadful Story About Harriet and the Matches is magical as young Harriet sets herself ablaze. The Party on High Street (Donna Williams, Brin Porter, Taylor Charles and Sean Gallant) bring their inimitable blend of enthusiastic musicianship to the mix—Porter’s bass groans and moans, Williams sets up a spectacular whine on the violin, Gallant injects danceable notes on the ballads, Charles’ introduces steel-drum-like tones to Fidgety Phil while Porter’s solemn solo on The Story of the Man That Went Out Shooting is in direct juxtaposition to the childlike antics of the puppets. In these horrifyingly cautionary stories, the characters finish “Dead, dead, dead!” as Wendy Cornock intones slowly in Cruel Frederick.” There is death by drowning (Johnny Head-in-Air), death by fire (Harriet), death by shooting (The Story of the Man That Went Out Shooting), death by self-imposed starvation (Augustus), death by knife (Fidgety Phil), death by blood loss (Snip, Snip—a cheerfully upbeat ensemble number despite the gory details). Overseen with cackles and chuckles by Bindon Kinghorn as MC, the intrepid band of thespians which includes Cam Culham as a proud and upright Father, manipulate a wide variety of puppets with precision, carry out murder in expeditious fashion, and embrace the heart of this dark and demented musical with gusto. Their careful renditions of offbeat songs provide a most unusual listening experience—one that will be for many the perfect antidote to the sweetness and light of the season. Judging from audience reaction on opening night, Theatre Inconnu has, once again, hit a profound chord with programming that appeals to the twisted side of human nature. This “Junk Opera” (a term used to describe the work of The Tiger Lillies, an English trio of cabaret-style musicians) is based upon the German cautionary-tales book for children: Struwwelpeter (1845) by Heinrich Hoffmann. The music is an intoxicating blend of Eastern European gypsy with French-style cabaret, and a sprinkling of melodic heart-rending ballad. The lyrics – in a very darkly comic manner – demonstrate what happens to little children who misbehave. The presentation style is one of puppetry, pantomime, story telling, and orchestrated mayhem. Local band, The Party On High Street – who have so brilliantly accompanied past musicals at Theatre Inconnu (including Alice by Tom Waits) – will be back to provide eclectic musicianship for a host of glorious local voices. Melissa Blank, Wendy Cornock, Cam Culham, Rosemary Jeffery, Bindon Kinghorn. The show is 90 minutes long, including one 15-minute intermission. Disclaimer: I received a complimentary ticket to attend Shockheaded Peter. I Think I’m Fallin’–The Songs of Joni Mitchell at the Belfry Theatre November 8-December 4, 2016. A Review. The Crucible by Arthur Miller at Langha Court Theatre November 18-December 3, 2016. A review.